AccuLux Witte + Sutor GmbH, located in Murrhardt, Germany, is better known under its brand name “AccuLux” and has been one of the technological leaders and innovators for the development of mobile lighting worldwide. In 1955 the company set the standard for environmentally friendly lighting by developing the world’s first rechargeable torch. In recent years the company has developed a new generation of working and emergency lamps as well as explosion-proof lamps tested for use in particularly sensitive and explosion-prone areas, such as the lamp STL 1 EX. 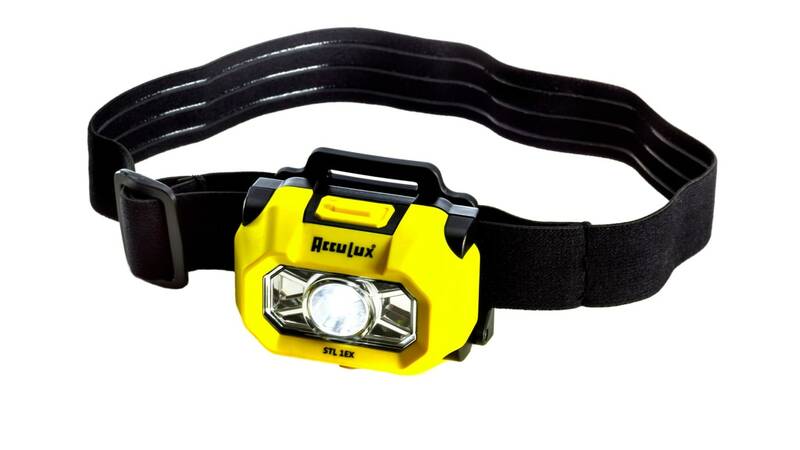 The high power LED headlamp STL 1 EX is ideal for professional and private use and can also be used in hazardous areas (Ex-zone 0). It has two light modes, is extremely bright and has a long operating time. STL 1 EX is powered by three alkaline batteries size AAA. Its remarkable range is approx. 100 m and it is possible to adjust the flexible head step by step. The handlamp HL 12 EX battery version (Ex-zone 0/20) and the HL 12 EX accu version (Ex-zone 1/21). Comfortable in use: The HL 12 EX accu version has the same charging unit as the HL 25 EX handlamp. And the Accu version can either be powered by Lithium-Ion-Accu or be used with non-rechargeable batteries (battery pack as accessory). Last but not least the lamp also impresses with its brightness and its light-weight of just 280 g.
This novelty HL 12 EX is another proof of the company’s competence in the field of explosion-proof lamps. AccuLux explosion-proof handlamps are ATEX safety certified lamps and fulfil the strictest classification standards for use in explosion-prone areas (gas and dust). For more information on the above lamps and the complete range just have a look at www.acculux.de. Synonymous for loadable light - also for the explosion-proof areas. With the development of the first rechargeable luminaire in the world, AccuLux set standards for environmentally friendly light in 1955. For our original 70 model, we received a gold medal at the 1958 World Exhibition in Brussels. More than 100 patents were registered for us in the over 70 years of company history. In the year 2000, we developed high-tech work lights with an emergency lighting function for the first time.